Australian brand will become the first wine to advertise on the Big Game in 40 years. Who says the Super Bowl has to be all about beer? Yellow Tail, the Australian wine brand, will break the Super Bowl’s nearly 40-year wine drought on Feb. 5 when it debuts its new ad in the first half of the game. "In an age of constant distractions, the Super Bowl is the one TV event where 120 million Americans stop and watch simultaneously," said Tom Steffanci, president of Deutsch Family Wine & Spirits, parent company of Yellow Tail, in a statement. "Yellow Tail wine is putting wine back on TV’s biggest stage for the first time in decades." 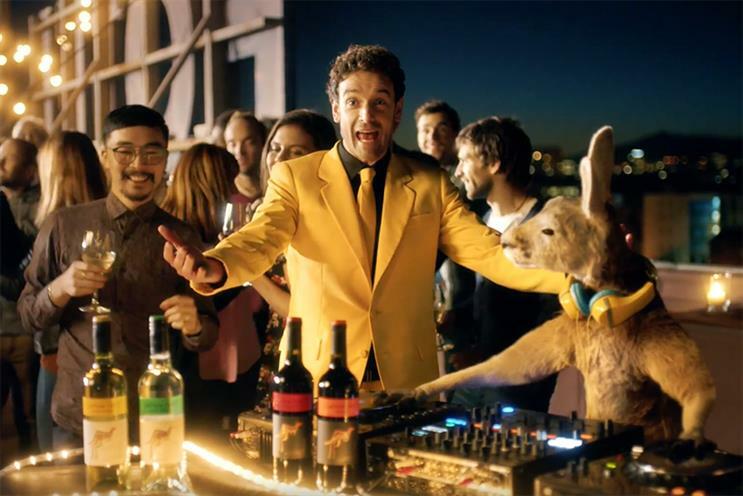 In the 30-second spot, the Yellow Tail kangaroo, which appears on the brand’s label, comes alive as "Roo," a character that silently drinks wine, barbeques and DJs. Meanwhile, the "Yellow Tail Guy," an Aussie dressed head-to-toe in a bright yellow suit, talks about the brand’s values. Aussie model Ellie Gonsalves, who currently stars in a Guess campaign, makes an appearance on the beach. Created by the Burns Group, the ad marks the beginning of a three-year marketing campaign called "Let’s Yellow Tail," as well as the first Super Bowl ad for the agency. The campaign aims to shed the pretensions around wine and position Yellow Tail as a more approachable alternative, according to Michael Burns, founder of the Burns Group. "From the start, Yellow Tail has challenged the formalities and conventions of the wine category," said Burns in a statement. "Yellow Tail, with Australian sensibilities and a belief that life is meant to be enjoyed to the fullest, is officially staking claim to the notion that with Yellow Tail, life is, in fact, more fun." The brand views the Super Bowl as a fitting venue for communicating Yellow Tail’s more casual vibe. "The Super Bowl is a perfect time to show that wine belongs at any celebratory occasion," said Renato Reyes, CMO of Deutsch Family Wine & Spirits. Research suggests there is an opportunity for wine brands to grab more of the Super Bowl beverage market. For the past two years, wine sales have increased by 9 percent in the week leading up to the game, and 20 percent of Americans will choose to drink wine over beer and liquor this year, according to Nielsen.